New research lead by a JCU researcher shows people with a strong connection to their community have better success in recovering from extreme weather events. 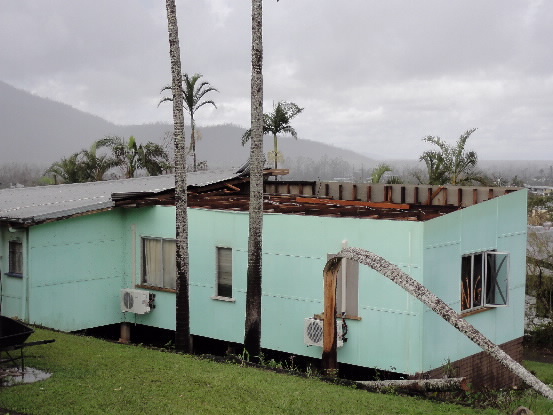 Caption: A Tully home after Tropical Cyclone Yasi. New research lead by a James Cook University researcher shows people with a strong connection to their community have better success in recovering from extreme weather events. In addition, residents who remained living in a community after a disaster were those who were more likely to be resilient to the disaster’s impacts. Dr Helen Boon, Senior Lecturer in JCU’s School of Education, was the lead author of Recovery from Disaster: Resilience, Adaptability and Perceptions of Climate Change funded by the National Climate Change Adaptation Research Facility (NCCARF). Dr Boon said the study showed having social relationships in the community rated highly, as did being financially comfortable. Dr Boon said the project analysed both individual and community resilience in Beechworth and Bendigo in Victoria and Ingham and Innisfail in Queensland; sites recovering from bushfire, drought, flood and cyclone. The study assessed the degree of community resilience and constructed a model to helpimplement appropriate and equitable emergency management policies and mitigation strategies for climate change events. Dr Boon said they wanted to identify beliefs, behaviours and policies that had supported community resilience to a disaster event, in both private and public sector groups. Dr Boon said 186 participants from the four communities were interviewed and surveys were completed by more than 1000 residents to generalise the interview responses. This work was carried out with financial support from the Australian Government Department of Climate Change and Energy Efficiency) and the National Climate Change Adaptation Research Facility. For interviews, Dr Boon can be contacted on (07) 4781 6030.